Its been a year since the iPhone was last updated and considerably more than that for the Apple Watch. Both have been highly anticipated and speculated about and for the most part the rumor mill was correct. [Apple](http://www.apple.com) released a pair of new iPhones: the iPhone 7 and iPhone 7 Plus and a pair of series of new Apple watches: Series one and two. For an even that wasn’t expected to have, much we got a lot. And these “boring” products are nothing of the sort. The iPhone 7 and iPhone 7 Plus mark one of the largest leaps forward of any iPhone I’ve seen and I’ve seen them all. Anyone who says this was lackluster must have been watching something else. Yes, there is some carryover from the 6 and 6S lines. The new phones are roughly the same size as their predecessors, have the same screen sizes, and the same screen resolutions. That’s pretty much where the similarities end. Every other component has been upgraded and in some cases, drastically so. The “same resolution screen” now has a cinema type P3 Wide color gamut and is 25% brighter. As someone who has owned the iPhone 6 Plus for almost two years, that’s improving on an already fantastic screen. The Touch ID button is no more, its been replaced with a version of the Taptic Engine that was introduced with the Apple Watch and then migrated to the MacBook line. It does a fantastic job of simulating a click depression on a flat surface. Also, did I mention it also meets the same IP67 rating as the Apple Watch for both dust and water protection. If it starts to rain or you hit by a wave on a boat ride, you no longer have to worry about your iPhone. For Japanese customers, there's also an update to the NFC system for Apple Pay. The newest iPhones are compatible with Japan's widely used FeliCa standard. It also means that Apple Pay will be coming to Japan. Every iteration of the iPhone has been faster than the last and the iPhone 7 is no exception. The A10 is so much of an upgrade, it even has a codename: fusion. The A10 Fusion is Apple’s first quad-core CPU, but in a high-low configuration that ARM and Qualcomm have used in their chips. The A10’s primary cores are for anything CPU intensive. For menial tasks, like email, the chip also has a pair of efficient cores. In all, this adds two hours to the iPhone 7 and one hour for the iPhone 6 Plus over the preceding models. The A10 also includes a 6-core CPU. All in all, you have a chip that is impressively both twice as fast as 2014’s A8 equipped iPhone 6, but also less power hungry. The LTE chip has been upgraded to support 18 different FDD LTE bands and another 4 of the TDD variety. If there is another LTE band out there in use that the new iPhones don’t support, you’d be hard pressed to find it. Audio has been upgraded, but also with a subtraction. The rumors are true, the 3.5mm analog audio jack has been removed. Let’s be honest, Apple is not the first to do this, Lenovo did it with its newest Moto series phones earlier this year. They won’t be the last to do so either. The analog output’s place place is a second speaker that not only allows stereo sound, but also louder sound than any previous iPhone. To replace the 3.5mm jack, apple has three solutions, two of which are in box. First, there is a new generation of EarPods which use the Lightning connector’s digital audio capability. If there is any controversy with this move, it’s that Apple is is still using its own Lightning connector over the similar USB Type-C. The second solution is a Lightning to 3.5mm adapter. The third option, and what people are increasingly choosing is Bluetooth. There Apple made a splash. 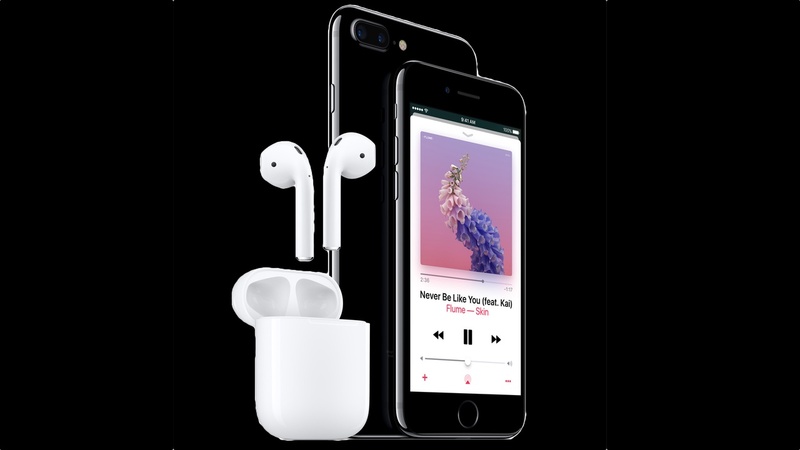 Announced right along side the iPhone 7 was the [AirPods](http://www.apple.com/airpods/) In-Ear Headphones. These are the most Apple headphones you will ever find. They are over-engineered in a wonderful way. The AirPods are packed with technology. Rather than being connected by any chords, the right and left AirPods are their own separate, but connected entities that resemble a matching pair of in-ear headsets. Rather then buttons, each AirPod has a pair of IR sensors and accelerometer to detect that you’re wearing them and activating beam forming mics when you’re talking. Setup is a breeze. Rather than the standard Bluetooth pairing, the custom W1 wireless chip will connect with your iCloud account and automatically connect the AirPods too all your devices, not the just once and then switch between them. If that wasn’t enough, the AirPod’s case is also their charger. At $150, they might not be cheap, but they are very, very Apple. Apple’s subsidiary Beats also got in on that W1 chip announcing the Beats X earphones, Powerbeats 3 Wireless, and Solo 3 Wireless All these 3 will take the easy connect of the AirPods and bring it to those who want a more traditional form factor. There was one aspect of the iPhone 7 series series that you may think I was forgetting. Au Contraire, I was saving the cameras for last. The new front camera is 7mp with an improved color gamut. Out back is where its at though. The iPhone 7 gains optical image stabilization, and a new six-element f/1.8 28mm wide angle lens. The new camera sensor is bigger and there’s an all new dedicated Image Signal Processor in the A10 Fusion. The flash has gone from Dual-LED to a Quad-LED that is 50% brighter. While this is a definite upgrade, the real winner is the camera on the 7 Plus. The larger iPhone gains a second 12mp telephoto camera to go with the wide angle. The two are used in tandem combined with the ISP to create a 2x optical zoom effect. It can also do digital zoom up to 10x. What’s more, Apple is working on a software update to create a Depth of Field Boca effect. Both models are available for pre-order this Friday September 9th with release in Tier 1 countries on September 15th. Available colors include Silver, Gold, Rose Gold, Black Replacing Space Grey, and a Jet Black. Storage is doubled at all price points with storage now available as 32, 128, or 256GB. 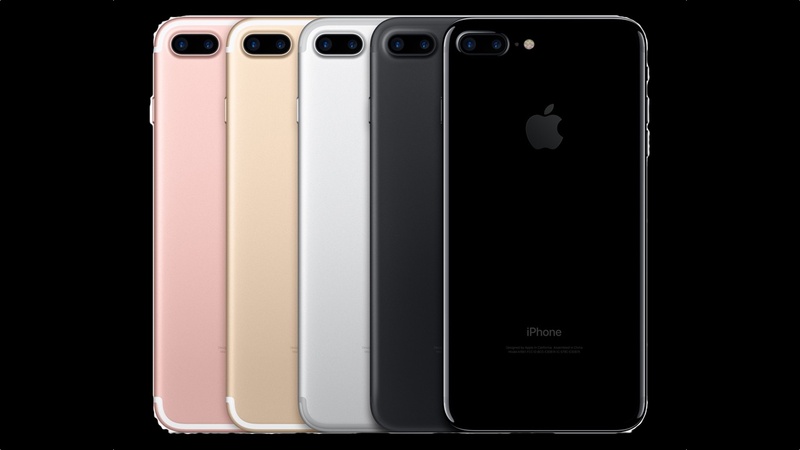 The iPhone 7 keeps the same $649, $749, ad $849 price points at the iPhone 6 and 6S before it, while the iPhone 7 Plus gets a modest $10 Price increase to $769, $869, and $969. 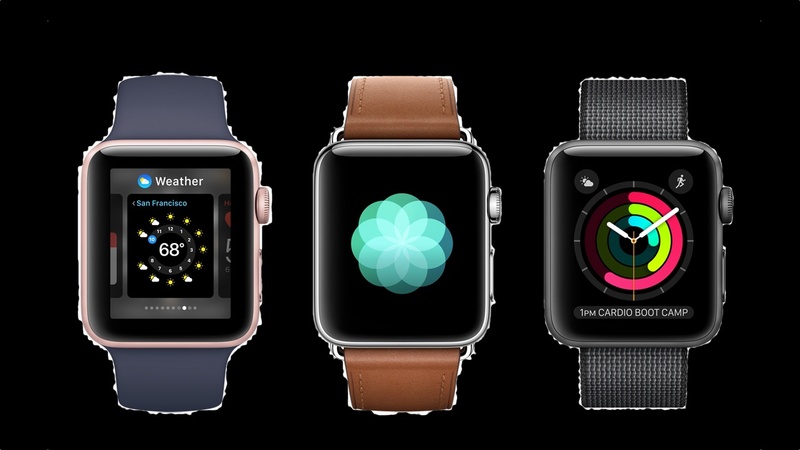 The Apple Watch family got its first major upgrades in both price and features. While keeping the same form factor, the Apple Watch got both cheaper and more advanced models while adding and updating some third party partnerships. If there is one aspect where the original Apple watch and its S1 system on chip failed, it was in power. The chip didn’t have the muscle it needed to run watchOS 1.0 or 2.0 and the platform suffered. While there are tricks to remedy this in watchOS 3.0, its still clear that the watch need more power. More power is exactly what it gets in the Series 1. They are exactly the same as the original Apple Watch Sport, but with the new dual core S1P giving it a bit 50% more juice. Price points are also more friendly, starting at just $269 for the 38mm version and $299 for the 42mm. Its available in the original Silver, Gold, Rose Gold, and Space Grey finishes. Where the Series 2 Apple Watch may look the same, its completely different and better inside. The new screen is twice as bright as the original for better performance in sunlight. The Series 2 also back the faster S2 chip. Where it really differs is in two features. First, its now rated for 50m dive performance instead of being just water resistant. As part of the water proofing, the redesigned speaker spits out water. For those who want to use their watch while leaving their iPhone at home, the Series two also includes a GPS chip. Pricing for Series 2 is $100 more expensive than the Series 1 starting at $369 for the regular models, and $1249 for the new Apple Watch Edition in a new ultra-hard white ceramic that replaces the gold plated models. The new Apple Watch Hermes has also been updated for Series 2 with new custom faces, new and updated bands, and in new colors. Hermes Apple Watches start at $1149 for kits and $339 for the new Single Tour Band. While Apple partnered with Hermes for fashion, they are also partnering with Nike for Fitness. The Apple Watch Nike+ is based on the Series 2 aluminum models in Black and Flat Silver. The watches come with perforated watch bands in two-tone colors. The Nike edition also includes the Nike+ Run Club app pre-installed and exclusive fitness-oriented watch faces. The Apple Watch Nike+ is exactly the same price as the normal Series two at $369 for 38mm and $399 for 42mm. Apple also announced the release dates for its OS updates. iOS 10 and watchOS 3 are coming September 15th. macOS 10.12 Sierra will launch a week later on September 20th.